In our next issue of Australian Country we are looking forward to the coming of the cooler months. 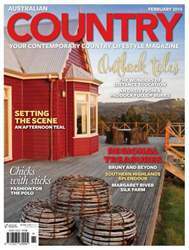 Our fashion feature celebrates clothes to wear for work and play on the equestrian front while our travel story heads to the spectacular countryside of Bruny Island and the Huon Valley in southern Tasmania. We have a fabulous story about Phil and Barbara Simpson’s home and vineyard in Western Australia’s Margaret River and a fossick around the home and garden of sculptor Al Phemister at Yass in the NSW Southern Tablelands. Also in the West we visit Australia’s first and only commercial silk farm in the Margaret River region and our garden story comes from outback Queensland. With the approach of autumn chief cook Sue Stadler rolls out her favourite fig recipes, we bring you some inspirational and aspirational ideas for decorating your bedroom as well as loads of shopping and collecting ideas.